Joe Torre is stepping up to the plate against domestic violence. It's a problem the manager of the New York Yankees has dealt with personally, growing up in a home where his mother was physically abused by his father. 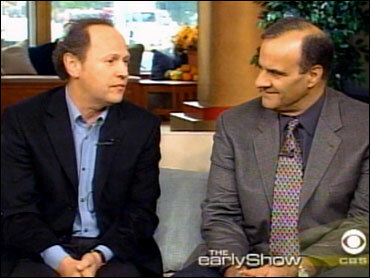 His friend, Billy Crystal, is also taking part in a new public awareness campaign. They are attending a big dinner Wednesday night in New York City for The Joe Torre Safe At Home Foundation. Torre tells The Early Show co-anchor Harry Smith, "A couple of years ago, my wife and I wanted to do something in my mom's name. She was abused. I was the youngest of five children. And my sister, Rae, who was the oldest girl, never did get married, so she was home all of the time and we just felt there was something we wanted to do in my mom's memory because of what she had to endure. She had no relationship, this woman. The only thing she lived for were her children, and you don't really appreciate that when you're a youngster. The only thing you do is take it for granted, so we felt we wanted to do something about it." Torre's father was a New York City detective, who left their home when Joe Torre was 11 years old. Throughout that time, Torre says he lived in fear. His father died in 1971. Torre says, "The fright that he brought to the house is what I grew up with, and the things that we're aiming our Safe At Home Foundation at or toward are the children, because I know they talk about husbands abusing wives, men abusing women, but they don't realize that half the men who abuse their wives abuse the children and just the verbal abuse is enough to scare a child. You don't want to grow up with that fright. "I was afraid to go home. When I used to come home from school in the afternoon, I'd see my dad's car in front of the house, I would go to a friend's house until I saw the car was gone and then I'd go home to the safe haven with my mom. But when I see my little girl, who is 7 years old, and she doesn't want to leave home - she just enjoys being home - it really makes me feel good," Torre says. According to a press release for the foundation, three million women are abused by their husbands every year. So at Torre's request, Crystal flew in from Los Angeles to host the event. "I say, what time? And what are we eating?" Crystal quips, noting, "It's not just me. It's going to be a great night tonight, and Norah Jones is going to sing, and I'm going to comede, and Bob Costas will be there, and we're going to switch off hosting the event, and we're going to have a great time for our friend and for these kids." Crystal has developed a friendship with Torre over the years. Asked what he respects most about Torre, Crystal says with a straight face, "Tickets, good tickets. It's good seats." Jokes aside, Crystal says, "His decency, his honesty, his friendship. You can talk about anything and, you know, it was that easy. We met at Yankee Stadium in '96. I spoke at Mickey Mantle Day. He liked what I had said about Mickey, and he gave me his number and said, 'Call me.' So I kept calling him, and it developed from there to actually a pretty funny relationship. Every time I'd call, they'd win. "Baseball players and comedians are superstitious: I'm wearing socks I wore at the Oscars four years ago and so we'd stop losing streaks. And when I'd call, they would win, and one time we were in a restaurant eating, and Joe said, 'We eat, we win.' And they did. Well, we were stuck eating and if we weren't together in the same city, he'd call me and said, 'I'm at a restaurant, do you have any food nearby?' And we ate and so here we are, eight years later, almost doing that same thing." The event will be dedicated to developing educational tools and focus on community outreach to break the cycle of domestic violence in homes across the country. "And, hopefully, save lives," says Torre. Visit joetorre.net to find out how you can help.